When parents practice tough love parenting, they adopt a parenting style that psychologists call authoritarian parenting. Find out if this parenting style is right for your child. Authoritarian parenting is a parenting style characterized by high demands but low responsiveness. Authoritarian parents are cold and aloof from the child’s emotional needs while having high standards. Authoritarian parents have many rules and very high standards. Many rules are in place to exert control over their children’s behavior or activities. They expect their children to follow these rules without making any mistake from a young age. Some rules are arbitrary or are never explained to the kids. Children are just supposed to know them and follow them. When the child fails to comply, whether explicit rules or implicit ones, authoritarian parents think that the child has done that out of defiance or incompetence. Neither one is acceptable in authoritarian parents’ eyes. 2. They are cold and non-nurturing. Authoritarian parents seldom show warmth towards their children. These parents are often cold and harsh. When they are upset with the children, they are more likely to yell or berate. They use the term “tough love” to justify their unresponsiveness and mean attitudes towards their kids. They also withhold love when the kids are not meeting their expectation. Authoritarian parents believe they are the authorities and that their kids should blindly obey them without question. They exert control over every aspect of their children’s lives, from the way the kids talk, how they act at home or in public, what they wear, what activities they participate in or even whether they achieve high academic performance. They don’t think that children have the rights or abilities to make their own decisions. Children’s autonomous thinking is strongly discouraged. They are also not encouraged to explore or act independently. Authoritarian parents impose not only behavioral control but also psychological control over their children. 4. They allow only one-way communication. Authoritarian parents do not involve children in their decision making. They use reasons such as “because I said so” when they demand children to simply do as the parents said. They do not seek or allow feedback from their children. Any attempt to reason with the parents is seen as back-talking or a challenge to the parents’ authorities. Children are expected to be seen and not heard. 5. They tend to use harsh punishment. Authoritarian parents like to use fear to control. When children do not meet their expectation, the punishment can be harsh and stiff. They employ punitive measures to force kids into following their rules. Some examples of punitive punishment are excessive time-out, berating, shaming, corporal punishment, etc. Authoritarian parents focus on punishment over teaching or modeling desirable behavior. Among Baumrind’s 4 parenting styles, authoritarian parenting’s effects on children are worse off when compared to authoritative parenting’s. Are highly compliant and obedient at home or around the parents. Become hostile and aggressive under pressure. 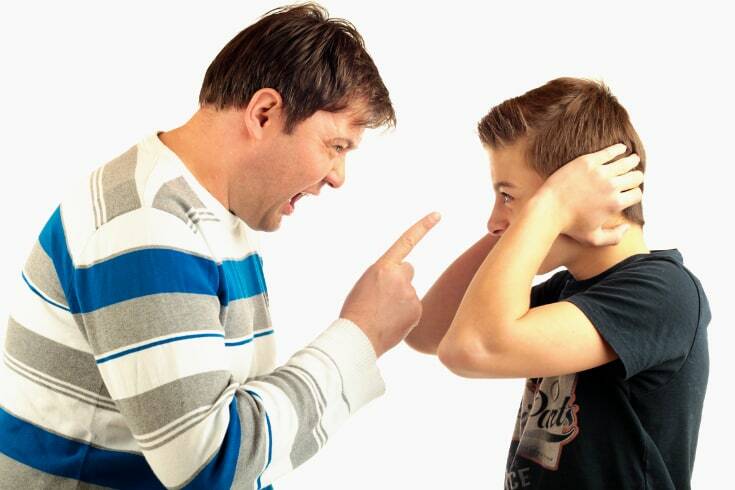 Some display more aggressive behavior outside the home when the parents are not around. Others appear overly shy or fearful around people. Are less resilient after failure. Have higher risk for drinking, smoking, substance abuse or mental issues such as depression, anxiety or suicide attempts. Next, let’s take a look at a couple of authoritarian parenting examples. * See Tiger Mom Parenting below. Tough love parenting is one example of authoritarian parenting. Some parents practice tough love parenting because they want to toughen up the child. They mistakenly believe that being tough to a child will make them strong. Other parents use authoritarian parenting because they are afraid of their children “ending up in jail”. They think being tough will instill discipline in the child, preventing them from making mistakes. Some parents are also worried that if they are not being authoritarian, their children would “walk all over them”. Parents who allow their kids to walk all over them are permissive parents. Permissive parents are warm and nurturing but they have no boundaries or do not enforce the boundaries consistently. However, the opposite of high-responsiveness / low demandingness (permissive parenting) is not low-responsiveness / high demandingness (authoritarian parenting). The problem of permissive parenting is not that the parents are warm and responsive. Responsive parenting actually helps children form secure attachment which research shows that it’s beneficial. The culprit of permissive parenting is not setting limits or not enforcing them consistently. The opposite of permissive is non-permissive! Authoritative parenting which is nurturing and have high standards is a much better “non-permissive” parenting style to adopt. A study was performed in Israel where 18-year-old men have to serve in mandatory military service. It was found that male adolescents who grew up in a non-nurturing environment coped and adapted worse in the tough military scenery than those who grew up in a nurturing household (Mayseless, et al., 2003). Unresponsive and non-nurturing parenting styles are also linked to many behavioral and psychological problems in children. Tiger parenting is another example of authoritarian parenting. Although most studies conducted in western societies indicate that authoritarian parenting is an inferior parenting style, some studies find contradictory results in school performance among some sub-cultures such as African American, Hispanic or Asian communities. In fact, a 2011 Wall Street Journal article sparked a huge debate across America on this exact topic of authoritarian parenting. In the article, the author claimed that the Chinese Tiger Mom parenting was superior to “western” parenting style. A previous study in Chinese University of Hong Kong (1998) supported this claim. That study showed that in Hong Kong, kids with authoritarian parents had better academic achievement than those with authoritative parents. So, is it possible that authoritarian, rather than authoritative, parenting style is indeed a better choice in some cultures? To explain the abovementioned research result, another study in Hong Kong reasoned that Baumrind’s parenting style model was ethnocentric. It did not take into account that even though many Chinese parents were authoritarian, the model didn’t capture the parental “training” concept in Chinese child rearing. That, rather than parenting style, was what led to the children’s success. It was accepted by some researchers for a while until it was later refuted by several studies. As it turns out, other researchers have found that even for Asian students, authoritarian parenting is linked to worse academic performance while authoritative parenting produces better academic outcomes. Many Chinese and Chinese Americans do excel in academics disproportionately. For example, students of Asian descent are the largest community of color at Cornell University. What about all these academic successes? Well, although many Asian and Asian American students are generally good at quantitative skills such as math and science, they do not excel in all subjects. For example, Asian American students on average have lower SAT verbal scores than mathematical scores. Because Asian American students spend more time on studying than playing or taking part in social activities, they tend to have less developed social skills. In China, a study on 8 year-old second graders also shows that children with authoritarian parents not only are worse in academic achievement but are also rated less socially competent by their teachers. These children also show more aggression and are less accepted by peers. Chinese students were also reported to be less creative and had less a sense of individualism, which also hinder their prospects in jobs that require original thinking. Studies have also found that inferior language ability and social skills are linked to Asian Americans having lower income than their white counterparts and being much less likely to hold managerial positions in the US. So success in mastering quantitative skills alone does not equate success in other areas in life. A person can be a math genius but still has no friends and less prospective job opportunities. Mental well-being may be another price of Asian students’ high academic achievements. A study has found that harsh discipline (an authoritarian practice) is linked to more depressive symptoms among Chinese American adolescents. A research in Hong Kong shows that 54% of Chinese students aged 15-19 years old report suicidal ideation, compared to 36% of junior high and high school students in the United States. This suicidal ideation is significantly associated with perceived authoritarian parenting, low parental warmth, high maternal over-control, negative child-rearing practices, and a negative family climate. Between 1996-2004, 11 of the 20 suicides of Cornell students, i.e. 55%, were committed by students of Asian descent. During that period, only 14% of enrolled students were Asian or Asian Americans. Data from the Center for Decease Control and Prevention National Center for Health Studies has also shown that among women aged 15-24, Asian American females have the highest suicide rates across all racial or ethnic groups. No research was known to link the suicides at Cornell and the female suicidal rate directly to parenting style. But from the overwhelming amount of testimonials, you can see the damages this type of upbringing did to many Asian and Asian American children. You have to wonder what the price is of these glorified academic successes. Relationships between parenting styles and risk behaviors in adolescent health: an integrative literature review. By Newman K, Harrison L, Dashiff C, Davies S.
The Authoritative Parenting Index: predicting health risk behaviors among children and adolescents. By Jackson C, Henriksen L, Foshee VA. Ethnic differences in adolescent achievement. An ecological perspective. By Steinberg L, Dornbusch SM, Brown BB. Beyond parental control and authoritarian parenting style: understanding Chinese parenting through the cultural notion of training. By Chao RK. Adolescent-parent relations in Hong Kong: parenting styles, emotional autonomy, and school achievement. By McBride-Chang C, Chang L.
If you suspect medical problems or need professional advice, please consult a physician. ParentingForBrain.com is a participant in the Amazon Services LLC Associates Program, an affiliate advertising program designed to provide a means for sites to earn advertising fees by advertising and linking to Amazon.com.